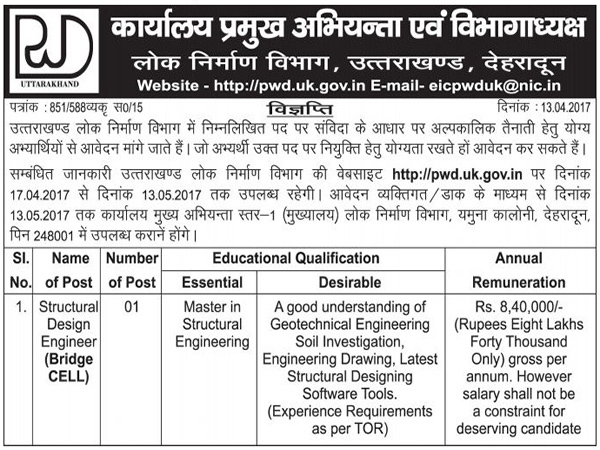 Public Works Development, Dehradun has released advertisement for the recruitment of Structural Design Engineer. 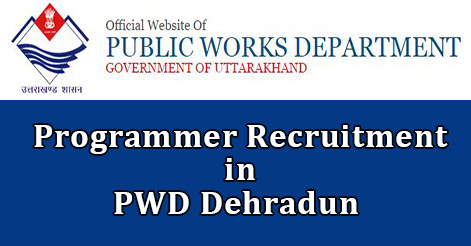 Head of Public Works Department, Dehradun invites applications on a prescribed format from eligible candidates to fill 01 post of Design Engineer. Interested candidates may apply on before 13 May 2017. The selection of candidate will be made as per Govt. Rules and policy of public works department, Uttarakhand . Eligible candidates may download the application form from the official websites www.pwd.uk.gov.in and send it along with all necessary documents to the address given below. Help us to improve this article/job posting "Structural Design Engineer Recruitment in PWD Dehradun". We would be glad if you can comment below and provide your valuable suggestions and feedback. If this page have any wrong information/list or out of context content, then you can report us as well.